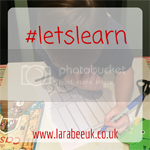 Welcome to #LetsLearn, my weekly linky for all your learning blog posts, from early motor skills with babies, to reading and writing for early years to GCSEs and beyond with your older children. You are welcome here at #LetsLearn. By linking, you agree for me to share your post on any social media channel and you will be added to my email and Twitter 'reminder' list. If you tweet out using #letslearn and tag me in @LarabeeUK I'll make sure I like and re-tweet for you and if you tag me on Facebook I'll give you a share.